Oh My Goodness. If you like la nature and emerald and tourquoise waters and waterfalls ala "Romancing the Stone" while you stay at a Balneario with thermal waters, this is the place for you. I tried to take pictures of navigational spots, but missed one. We're staying at the Balneario in Church's 3rd edition; about 8km along MX85 south of Ciudad Valles. Cost is 90 pesos a night. Water pressure is non-existant but they'll bring a water pump out as the bomba is fried. Electricity is EXCELLENT! The electrical hookups look frightening, but the luz is very good; we run through an external surge protector and if the corriente is too low or too high or polarity reversed, it is no go. We've got the water heater and microwave on without any trouble. So, following http://www.vallesyhuastecapotosina.com/rutas.htm, Ruta 3. Basically, leaving the Balneario, go north on MX85 to the libramiento (very well marked in this direction) and take MX70 towards SLP (the libramiento at this point). Left at the largest Pemex you've seen with an Auto Park; the works. Go along until the libramiento meets up with MX70 and head towards Rio Verde/SLP. Look carefully around km7 for a small sign to El Naranjo. The road on the way to El Naranjo. See the cliff in the very middle? That is where Mico is. Continuing along the road to El Naranjo, you'll hit the town of Estacion Quinientos where you'll take a right (follow the signs to El Naranjo). 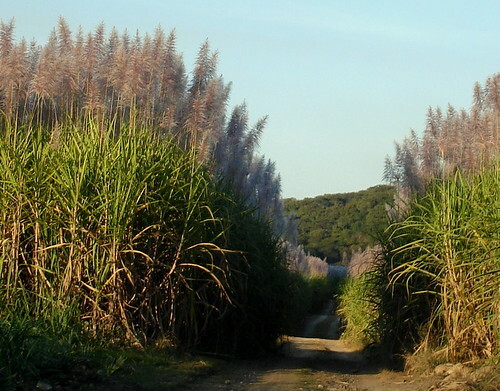 You'll then hit a town that explains all the cane fields you've been driving through and a huge, belching, polluting cane fabrica. but if you miss it, turn around and you'll see a sign for Minas Viejas. 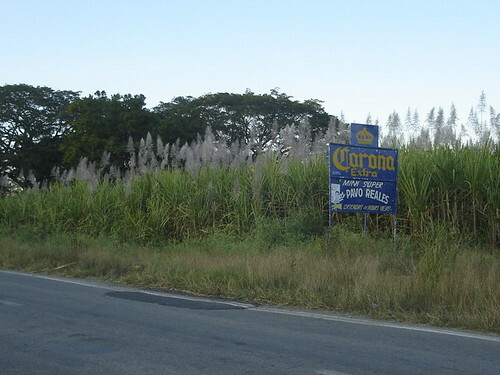 I always drive in Mexico looking at the directional signs I've passed because I always find that the directional signs are sometimes missing in one direction. Take this left and you'll be on a sinuous paved road heading UP. 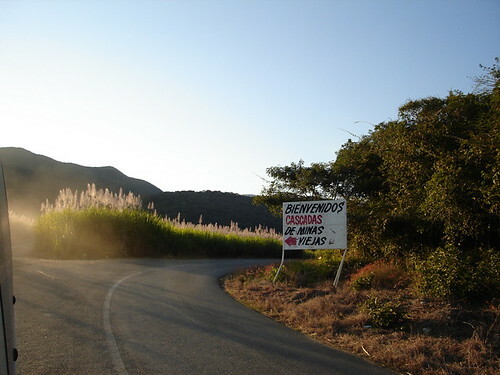 About 5-6km up this road you'll come to a sign for the salto but it points to a cane field. and you'll come to an open spot to park. You're at the top of the salto. Walk down the 4wd road (well, it looked that way to us) and you'll be at a surprisingly somewhat developed area; bathrooms and a wood and gravel STAIRCASE! We went back to the Mico/Micos/Meco waterfall and found a couple things. If you want the developed area, follow the sign for Pago/Pago (dirt road) off to the right of the road to Navajoa (same road as described above). There are MANY places to camp here and I really think you could get a TT; definitely Jonna's LD (Tortuga) and probably even our 17 meter/ 52ft van+trailer. If you have a toad, you'd want to check it out for yourself first though. Follow the dirt road all the way to the end and you'll find yourself at a dirt parking lot. You left the pavement back on the main road. You pay 25 pesos/car to park; this is for the site and the parking. I think that even if you didn't bring a car in (we saw some mochileros) you still pay the 25 pesos. You can find all kinds of cheap junk and food here and also some swimming areas to swim. It seems that the lifejackets are required but when I explained that the kids could swim very well and we swam up to the falls, that didn't seem to be a problem. THere are a LOT of danger signs all around though. There also seem to be guides that will take you up the sets of falls and back down again. 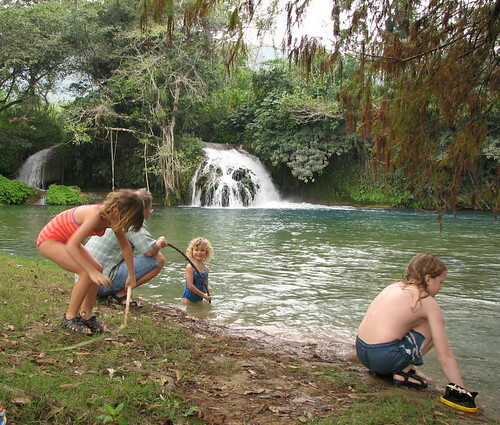 The kids LOVED watching one pair jump DOWN a fall and swim out (with salvavidas). IMO, the best swimming and viewing was at the top of the falls. Go past the dirt road to Pago/Pago and stop at newly contructed concrete steps at the roadside. THe steps go DOWN to the river, so look carefully. There are NO signs or anything. You know you've found the steps as they are the ONLY ones :) and you go right by a power station. Here you'll find lovely still pools, many more falls and more beauty and very few people. We went to Xilitla one day; there are COFFEE PLANTS GROWING IN THE TOWN!!!! I can't tell you how inexplicably excited I got to pick (through thick barbed wire; they must know the Gringos can't resist) a RIPE RED BERRY! But don't do this. I really shouldn't have, but I couldn't resist. Take MX85 towards Pachuca (from the Balneario) and while Jonna and Mimi did it in their LD, leave the rig at home. It is very windy and I still find it hard to believe that they drove their rig in town! I had trouble with JUST the van. Ok, so you're on MX85 and the route (MX120?) to Xilitla is well marked. You know you're close when you hit La Y Griega (The Y). Lots and lots of orange and mandarin opportunities along MX85. 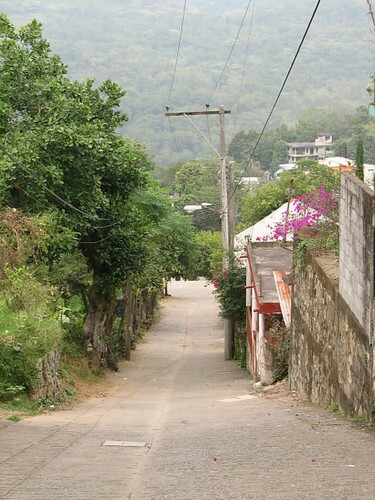 The road to Las Pozas is BEFORE town; when you see a "Jesus" type fish symbol, that is it. THe road is rock/dirt and VERY ROUGH (only to Las Pozas) but definitely doable. Follow the road; you can't get lost; there are some orange flechas (arrows) on trees and poles; follow those and you definitely won't get lost. In town (Xilitla) we decided to spend the night at a hotel and really loved Hotel Dolores. It is removed from the noise of the centro but well within walking distance. And down the street you can get fresh green coffee beans! ! ! Coffee! Fresh! In town, we ate at the Cafe de las Flores or something like that and it was INCREDIBLY cheap. Tamales were two and a half pesos each and WONDERFUL. Coffee served there is sweetened. We saw a place with an espresso machine and it looked like good coffee but it was closed. It is a sweet town. Oh, the Hotel Dolores was (trying to remember) about 230 for a single, 450ish for a double and we paid 500 for 3 beds and six people. The rooms with a view are 500 irregardless of people. The rooms with a view have MAGNIFICIENT views. Well worth it. 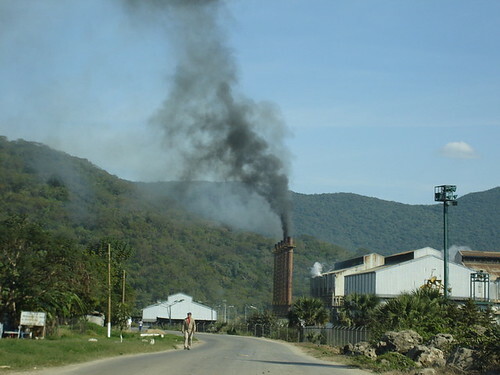 It is about 1.5 hours from El Banito (Ciudad Valles) to Xilitla. We also went to the falls at Tamasopo. Honestly, I would give them a pass. They are small and while they are nice, they aren't anything like the others. 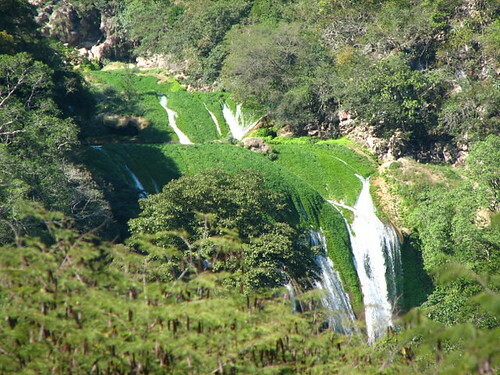 We went to "Las Cascaditas" or "El Paradisio" and unlike all the other saltos this one is private. You pay 140 pesos (we only had 120 so that is what we paid) and I think you could spend the night there for that price. We only spent the afternoon. The kids really liked it but we didn't go in (too cold in January). There is definitely room for a big gigantic rig in their parking lot/camping area and they do have electric. I'm not so sure about the road TO the camp/falls though. 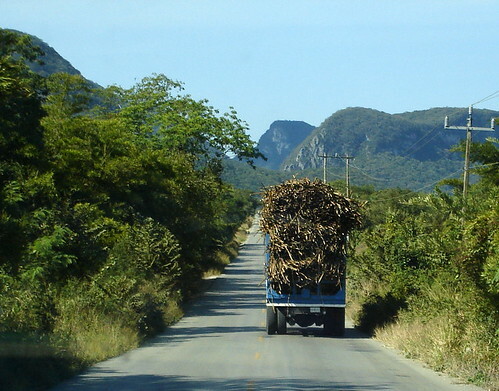 Take MX70 towards Rio Verde and at about KM55 you'll hit the turnoff for Tamasopo. You've really climbed to the turnoff and now you're going to go down. It is one of the most beautiful drives we've ever done. Drive down through the town and just past the secundario you'll see, off to the left the turnoff to the cascaditas. This is a dirt road now and you'll eventually come to a Y. We chose the right branch and Las Cascaditas and El Paradisio. I'm not sure if the other place has falls or just water. Both are private places. Back in town you can find many signs for the "Puente de Dios" and it looks like a lovely area, but we spent all afternoon at Las Cascaditas and were ready to go home. It was about an hour to the turnoff and about 30 minutes more to the cascaditas (9km?). Oh, there are upper and lower falls; the picture is of the upper falls. Go to my Flickr page for more photos. Great trip logs! Keep them coming! Pictures like these made me hate my desert home. 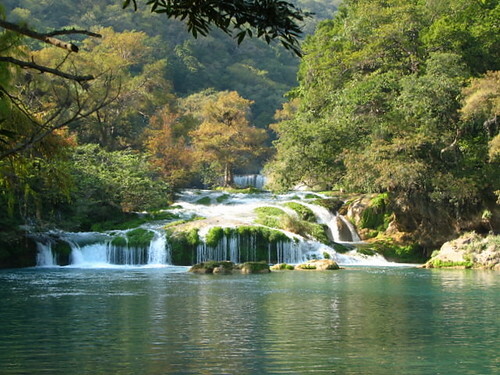 Truly, hopalog, what a wonderful photo-journey through the Huasteca. Thanks so much. Let me know when you'll be in the Guadalajara/Lake Chapala vicinity and I'll take you to pick coffee right here in the area. 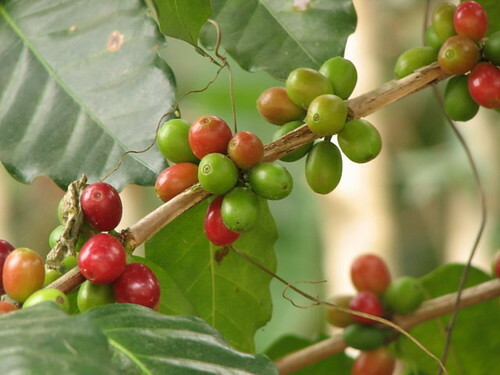 You can enjoy it all the way from the tree to your cup. Wow! 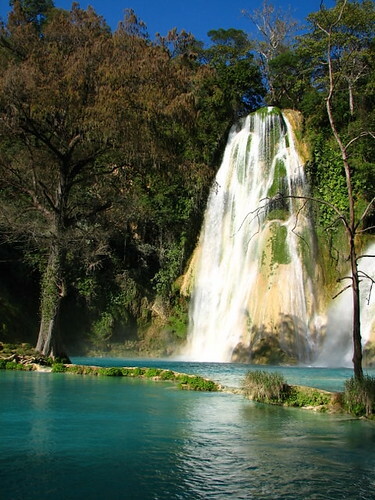 What a super-nice and informative job you did on the Huasteca area falls and pools. I once attempted to navigate through the area, but had the misfortune of hitting it during torrential rain and flooding. Can't remember the year off hand. Many major roads were closed! Even cities like Mante and Valles were next to impossible. I'll try to take a jaunt up there (from Xalapa) and see what I've missed. 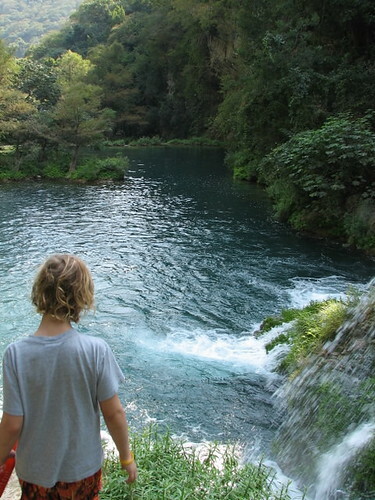 Looks like you've found some first-class swimming holes! Great pictures, hopalog. I have two coffee bushes in my back yard. You have to let them dry, then peel the outer skin before you roast them. Have not tried it yet! We actually ate the beans (one "cherry" = 2 beans) we picked; raw, but are waiting for Coatepec (sp?) to buy more beans. 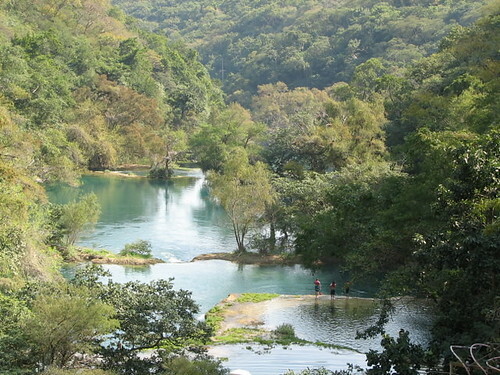 We like an espresso roast, and that is pretty much non-existant (that we found) in the Huasteca.